As a rule of thumb, you should be far enough back to at least see the other guy’s rear differential. (If the differential is just visible above your hood, you’re about 17 feet away.) Any closer than that, and everything between you and the other vehicle is in a blind spot. You never see the difficult obstacles so you can pick a line. And you won’t have time to react if need be. Back off so you have a better view of the trail and obstacles ahead. 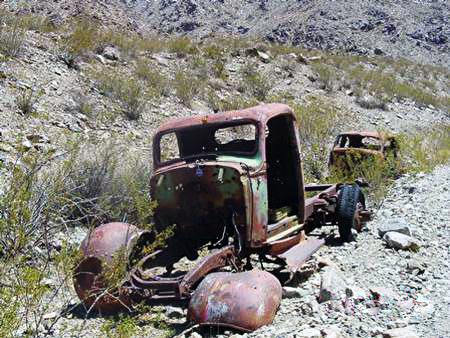 Tailgating is a real problem on dusty roads—you can’t see squat. There could be a washout or deep rut up ahead, and you wouldn’t see it until it’s too late. You’re probably wondering, aren’t the drivers communicating with each other? Maybe, but maybe not. A good 2-way radio is indispensable in these circumstances. That’s why I always require a 2-way radio in each vehicle during my off road trips. CB is fine, but I’ve found that FRS radios perform well. The lead driver lets everyone know of obstacles, blind curves, oncoming vehicles, and other issues. During my trips, I ask the last driver (my “tail gunner”) to acknowledge my broadcast. That way I know it’s been received properly. Any vehicle that didn’t hear my message will likely hear the follow-up transmission. I can’t stress enough that you must keep your 2-way radio on and any distracting noises to a minimum. Turn down the commercial radio and your iPod. You should be focused on the road ahead and any instructions coming over the 2-way radio. When you’re the lead driver, remind the others to keep their trailing vehicle in sight. If each driver does this, no one loses a vehicle when the driving gets tough. Even with reliable communications, verify that the trailing vehicle is still behind you after you take that fork in the trail or make some other change. Any drivers really focused on the obstacle just ahead can forget a set of instructions they heard moments before. Similarly, if your vehicle encounters a problem, make sure you get on the radio. The vehicles ahead and behind should stop. If everyone is looking out for the guy behind, the entire caravan will soon stop. Address your problem, and resume the drive. It all boils down to teamwork and trust, with every driver knowing and adhering to protocol. Respect Your Teammates. Arrive Prepared. If you’ve considered going off road but are reluctant to do so, relax. The following information should convince you take up the hobby. While you are reading this remember: in town, you can be in a pile-up as the result of other driver’s errors and actions. 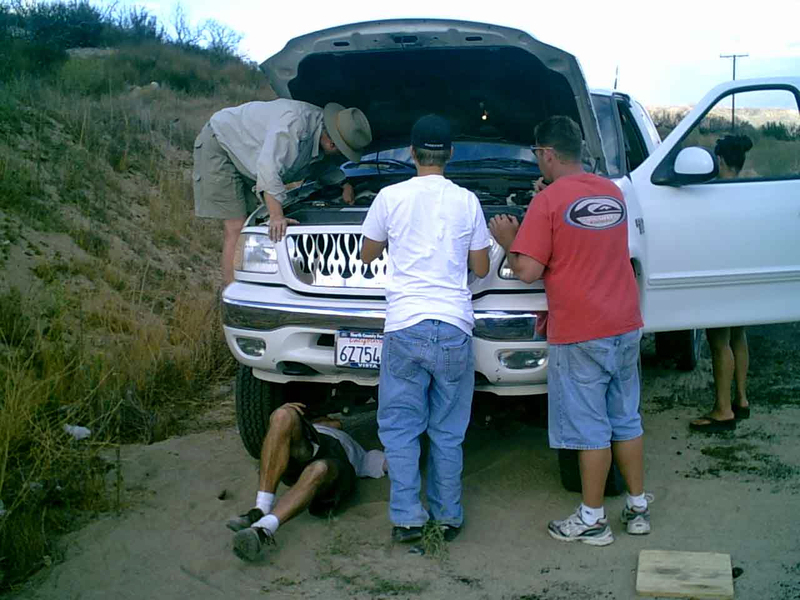 Off-road in almost every instance the driver made the decision and judgment that lead to his predicament. Need to figure out what is wrong! In last month’s article, Proper Storage Maximizes Space, Minimizes Down Time, we reviewed various storage methods and explained why it’s important to be neat and compact. This article goes into more detail about what you should carry. Normally we think of in terms of basic supplies. Here we’re focusing on spare parts. Bear in mind that the farther you are from civilization, the more troublesome a breakdown can be. The more difficult and more remote the trip, the more stuff you need to take. For a day trip to the local mountains, you may only need to throw in a cooler and a warm jacket. Your buddy can run into town and bring back tools and parts. 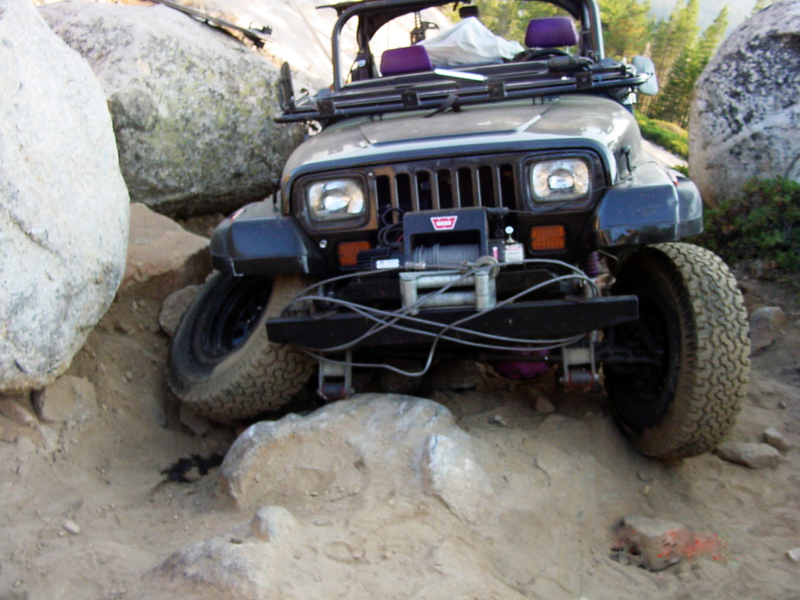 For a longer camping trip or a difficult trip like the Rubicon, you need a lot of gear and in particular spare parts. You may wonder, what are "trail prices"? The term refers to the extra price you pay to compensate for a critical part you didn't bring along. One example is the part you had to buy from a buddy. You might pay 3 times what it cost at the auto parts store. Another example is the time needed to acquire or fabricate a part.In essence, any cost that allows you to drive off the trail under your own power. Stuck 3 day on Rubicon. Had to go to town for parts. A complete set of front axles (inner & outer for both left and right) is a good investment if you are doing extreme and remote trails like the Rubicon. The electronic system in today's vehicle has components and sensors for which there is no work around. The worry here is that a critical part will go out leaving you stranded. Without a spare sensor the vehicle's brain will not function. On the list of critical parts with no work around are your coil/ coil pack, fuel pump, MAP sensor, crank sensor and the starter (on automatic transmissions). Spark plugs and spark plug wires (on older vehicles) bear watching, too. Replace the set of wires if any are cracked. When you replace the wires, save the longer ones and pack them with your spare gear. If you ever need a spark plug wire while off road, you’ll have a spare. Regular inspection, while important, won’t catch all the parts that are ready to go. Sensors are perfect examples. There’s no way to tell in advance when a sensor will fail. If your vehicle has a lot of miles on it, I encourage you to replace the sensors mentioned above, and keep the old one to bring as a spare. One big decision 4WD owners need to make after buying a vehicle is whether (and to what extent) to upgrade their vehicle. Should they swap in a heavy duty tie rod with beefier tie rod ends, for example, or leave the vehicle in stock condition? Understand that upgrading adds cost and, in the case of heavy duty tie rods, new tie rod ends might be available for purchase only from the manufacturer. Damage one on the Rubicon and you will be waiting on the Greyhound bus to deliver a part (and that is just into the closest town, not out on the trail). There are good reasons to go either way. My suggestion is that if you decide to upgrade, keep the stock parts in your vehicle. 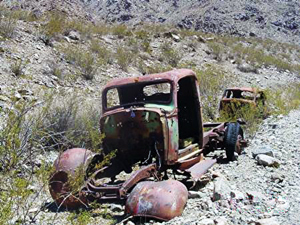 You may discover while on the trail it is easier to convert back to stock parts than to repair. Even with a comprehensive set of spare parts, you may find that you need to fabricate or fix a certain part. Consequently, I suggest you buy and pack some additional general purpose gear. Useful spares include fuses, hoses, sealants, hose clamps, baling wire, electric wire, chain, duct tape, zip ties, ratchet straps, and the ability to weld. Install a Premier Welder under the hood. Now you’ve got a welder at your disposal, but it doesn’t take up valuable space inside your vehicle. 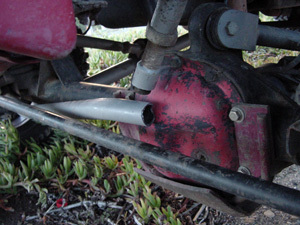 Many four wheelers have fixed a bent tie rod using the handle from a Hi-lift to reinforce the tie rod. A few track bars were fixed (just to get home) by welding two big wrenches across the broken section. A cracked axle tube was held together with chain wrapped around the lower control arms and then using the winch to take the slack out of the chain. A broken rear control arm bracket was held together with a number of ratchet straps until pavement was reached. A mechanic’s tool set is always valuable. You don’t need a full, 200-piece set, however. Select the top tools, and store in soft-sided containers (pouches or military packs). Those will tuck nicely into nearly any spare space or crevice. Taking a friend on the trail with a similar vehicle doubles your spare parts. While it will not help get you off the trail, AAA's 200-mile tow plan will get your vehicle home where it is easier to work on it. And in the worst case turn the hubs to free-wheeling and drop the rear drive shaft. Yep, turn your vehicle into a trailer. Packing spare parts may seem like a daunting task. There’s no way to know in advance which, if any parts, will crap out on you. And, you have a limited amount of space to work with. Driving off road for decades has given me some invaluable insight; following the suggestions above will help ensure any breakdown you experience has a minimal effect on your trip.